Is the Cloud Creating Better IT? Click "Attend" below to join this live expert panel session debating whether cloud computing has created better IT. Bob Tarzey, Analyst & Director, Quocirca; Len Padilla, Senior Director of Engineering, NTT Europe. This session will be moderated by Peter Judge, UK Editor, eWeek Europe. 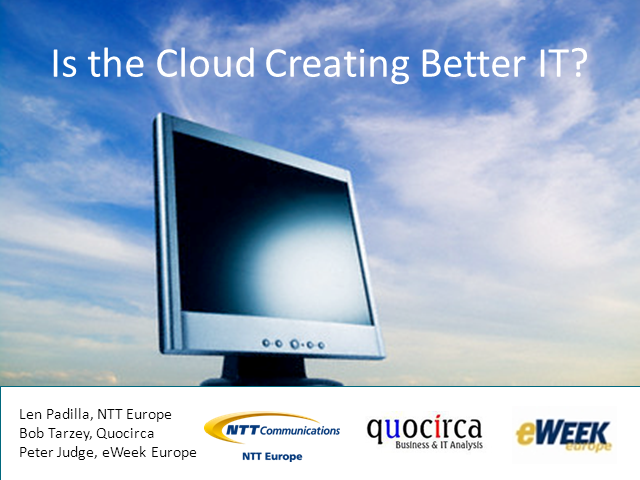 Title: Is the Cloud Creating Better IT?